Imagine their delight when they open the door to this charming wicker basket filled with the season's merriest flowers. Who on your list would love this joyful gift? Who wouldn't? 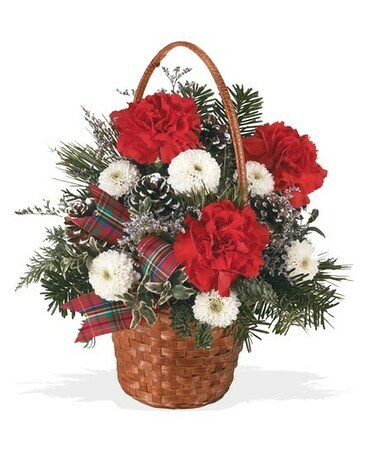 A 4" wicker basket arrives with an arrangement of red carnations, white chrysanthemums, misty blue limonium, noble fir, white pine, flat cedar, oregonia and other winter greens.